You are here: Home / Tablet PC News / What is Microsoft Surface? After getting to see so much of the Apple iPad range of tablets, along with the hundreds of tablet me-too’s that followed, here finally is a tablet device that comes in like a breath of fresh air. While we have seen the Transformer from Asus, which shined in the productivity department and bridged the gap between tablet and laptop, but it never could dislodge the success of Apple. Now the million dollar question is: will the Microsoft Surface will be able to do that? To get to that, we need to have a clear understanding of what the Surface actually is. 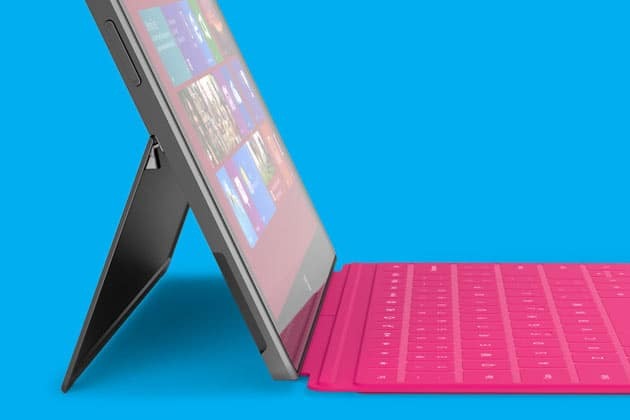 Clearly, the approach that Microsoft followed with the Surface is that they developed a tablet first to which they attached a removable keypad to further enhance its appeal and functionality. This is in sharp contrast to the convertible tablet range we have seen at the recently concluded Computex such as the Taichi or the Acer W700, which are more like a laptop or a netbook with a removable display unit. They have their upsides (a separate battery unit under the keypad greatly enhances battery life, for example), but what we have with the Surface is primarily a tablet that can also be counted among the ultrabook segment. To start off, when you hold the Surface in your hand, it’s a tablet with an iPad-like cover on top. The tablet is well built and does look sturdy while at the same time exuding a strong sense of style and character. The tablet is not the slimmest or lightest around and does not make any pretensions to be either. The tablet is made of magnesium, employing a new manufacturing process, VaporMg, that imparts it with greater strength while keeping the overall weight within acceptable limits. The tablet also hides a built-in kick stand at the back, where almost one third of the entire rear portion can be flipped open which will keep the tablet upright when used in laptop mode. The kickstand simply merges with the all metal back when pushed back and provides no hindrance when the device is used as a tablet. Open the cover of the tablet and you will be greeted with a keypad built into the cover’s inner face. This is truly a smart move by Microsoft and is unlike the Apple offering for the iPad which is nothing more than just a passive cover offering protection to the screen. Measuring just 3 millimeters thick, this is as thin as it could get while also allowing users to use the Surface as a laptop as well. There is not a battery unit hidden underneath the keypad, unlike the Transformer Prime, (worth mentioning here, the Surface offers USB 2.0 ports along with a HDMI out slot and a microSD card slot) though let’s not forget what we have with the Surface us basically a tablet device that can also make it to the ultrabook segment without adding any extra weight. The Transformer Prime, in turn, can be well over a kilo together with the keypad unit. Interestingly, the keypad isn’t the only input method for the Pro version of the Surface; the display is also receptive to digital pen input. In fact, the Surface has two digitizers, one for touch and another for digital ink. Coming to the software side of it, the Surface comes with the full blown MS Office experience allowing users to open and edit Word and Excel files or make PowerPoint presentations. The Surface will also allow for multitasking, enabling users to open two screen simultaneously. Then of course, the Surface is perfectly suited to open full professional programs like Photoshop, which was impossible in any other tablet so far. The Metro UI in itself is an innovative development that provides real time information that does not require to launch the concerned apps every time. Unfortunately, the software is sluggish at times, something that is not quite acceptable in a touchscreen based device. Microsoft ruled the PC era that accompanied the mouse and the keyboard and it seems it is having some trouble making the transition to touch based systems. This is crucial as the entire computing segment is poised for a radical shift towards touchbased inputs and farther away from mice and physical keyboards. Statistics reveal such a scenario as tablet sales are expected to far outstrip sales of PCs in the coming days. Steve Jobs had also gone a step ahead and had predicted the tablets “as the future of personal computing with desktops nearing the end of their life.” Surprisingly, while Apple with its iPad never could offer a device that could replace the PC, it took its arch rival Microsoft to pull off such a device. Sure the Surface can’t be considered a PC replacement just yet but does show how things can be taken forward with the tablet device. Its sleek, beautiful, and functional, and the only thing is how consumers take to the Surface. Also, to combat the iPad, the Surface has to be priced right and offer decent levels of performance and battery life. The specs of the Surface have won the initial round, but the real battle has yet to begin. Have not been this excited for a Microsoft product in a while. Also you guys are missing some details. The specs you are talking about are for the RT version of the tablet and the RT tablet will not work with desktop applications. Surface RT will have office apps not a full desktop Office. Microsoft surface. Too late for the party or ready to make new friends?